Technically taken it’s a reissue but not of the type of glossy deluxe editions people are fooled with. The 12-inch, now out on Porridge Bullet imprint, is a reproduction of the material released in 1991 as a friends-only run of 20 cassettes by the Estonian act Hypnosaurus with Aivar Tõnso (keyboards, tapes) and Railo Pals (drums). Also known as Hüpnosaurus, the act later consisted of Tõnso and Raul Saaremets (aka Ajukaja), both till our days playing a pivotal role in the Estonian electronic scene. In 2004 they issued a best-of compilation on Ulmeplaadid. 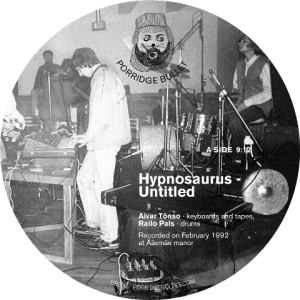 Going back to the beginnings, in the presence of legendary John Peel Estonian fledgling electronics scene witnessed Hypnosaurus’s psychedelic live jam at Ääsmäe manor in February 1992, where the duo amalgamated the sound of Sheffield and Manchester with deep electronics. Unpolished tones of Soviet synths and cosmic voice modulations resulted in a noisy lo-fi journey, now captured to the A-side of the release. On the flip, nobody else than Chicago’s Hieroglyphic Being replays the Estonian heritage, rolling out his customary broken-sounding equipment. After a long and messy band-room intro, dissonant rhythms go hand in hand with distortion overload to splinter any attempts of harmony. Raucous affair for experimental floors.